Nigerien government announced on 07 December 2018 the extension of State of emergency in Diffa Region three more months. Reportedly, on 10 December 2018 militants cell discovered 15km from Birni N’Konni at Jima-Jima village, Sokoto Region on the borders with Nigeria. Local prefect pointed out this was an attempt to establish a coordination site to exchange information between different militants’ cells. On 07 December the government declared State of emergency in Gotheye and Tillabéri departments, Tillabéri Region. 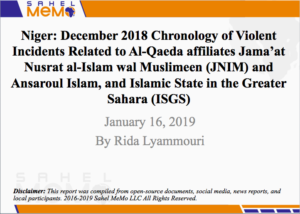 On 29 December 2018 JNIM released statement claiming the attack against police station of Tera, Tillabéri Region carried on 30 November 2018. On 21 December 2018 and under the initiative of Mr. Mahamadou Bakabé, Diffa Region Governor, a meeting on the security situation extended to the administrative, customary, military and religious authorities in the presence of representatives of youth, women, and the media. The purpose of the meeting was to discuss the very worrying security situation and the upsurge of attacks recently in addition the phenomenon of people kidnapping by suspected Boko Haram militants. Important recommendations were formulated to deal with the situation, with particular emphasis on monitoring and the ability of the population to be resilient to the shock. In December hundreds of schools have closed or suspended their courses in Tillabéri Region following threats from ISGS militants. These schools are mostly located near Ayorou and Abala on the borders with Mali, and Torodi on the borders with Burkina Faso. French and Nigerien forces conducted air-ground joint operations near Tongo Tongo, Tillabéri Region. According to French defense ministry statement at least 15 suspected ISGS members killed while arms and ammunition seized. Notable increase in acts of intimidation, ethnic related violence, and armed banditry in Tahoua and Tillabéri Region during month of December 2018 forced number of families to seek refuge in Ménaka, Mali. In December 2018 important number of shops ransacked in villages in Diffa Region near Lake of Chad during incursions by suspected members of Boko Haram.